2015: Out with the New and In with the Old! 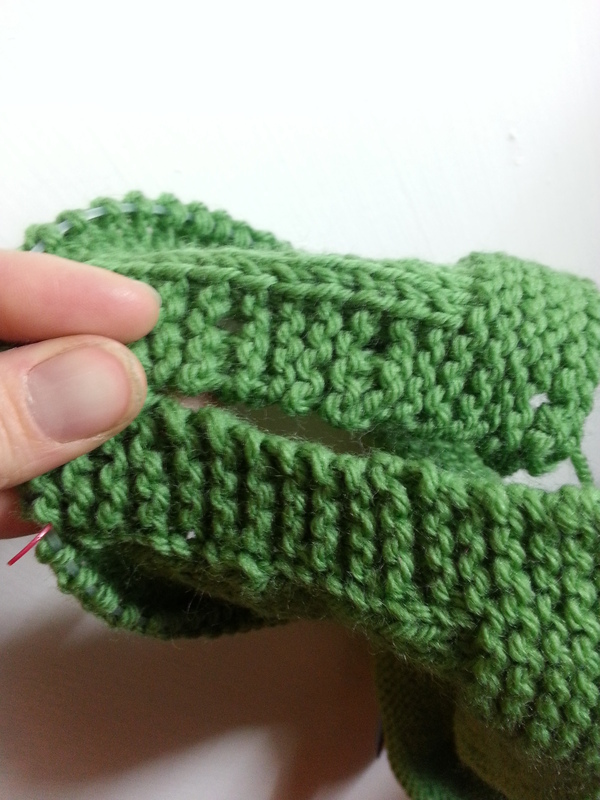 challenge: How to knit with what you’ve got when your yarn doesn’t fit the pattern. When you have been knitting for many years, you develop a yarn stash. Extra yarn left over from previous projects, yarn that friends or family gifted you, yarn that you bought for a purpose never fulfilled—they all live in the stash. My stash lives in a small underbed storage box. 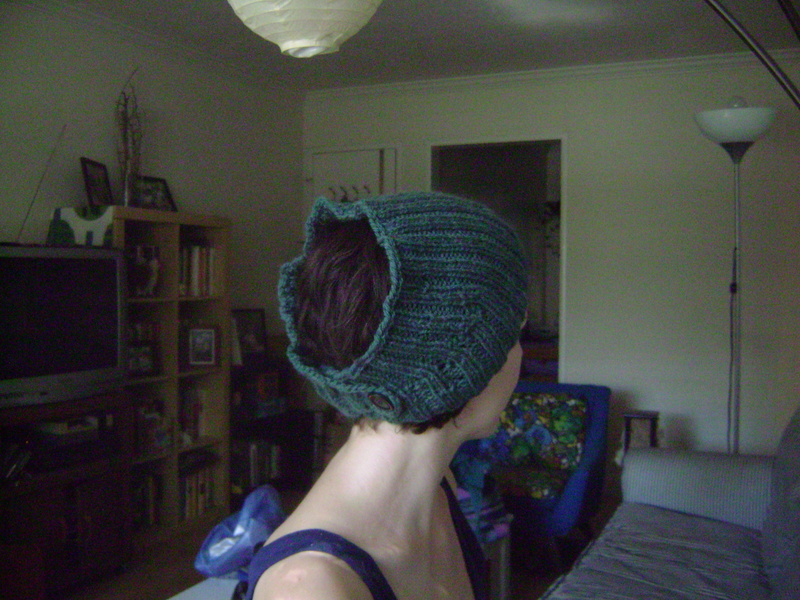 I’m trying to get even more inventive with the ways I can knit from my stash. 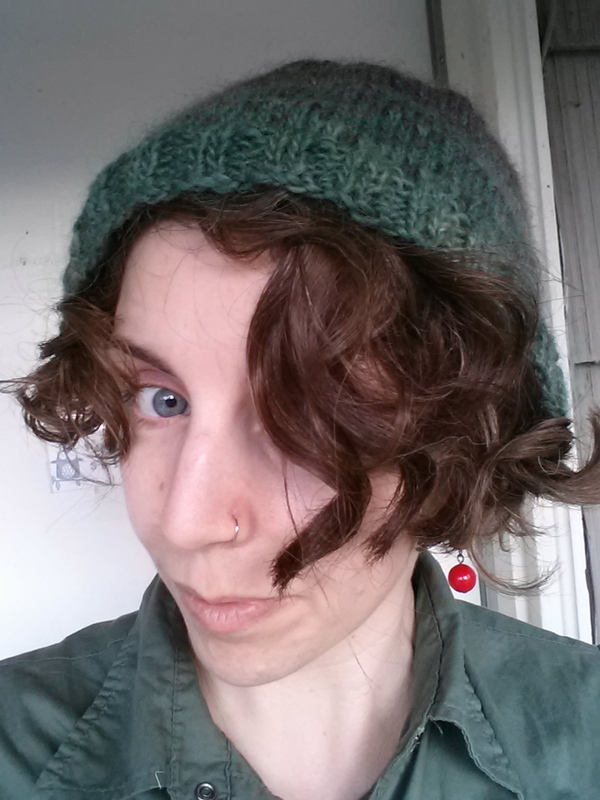 This hat is one of those projects. 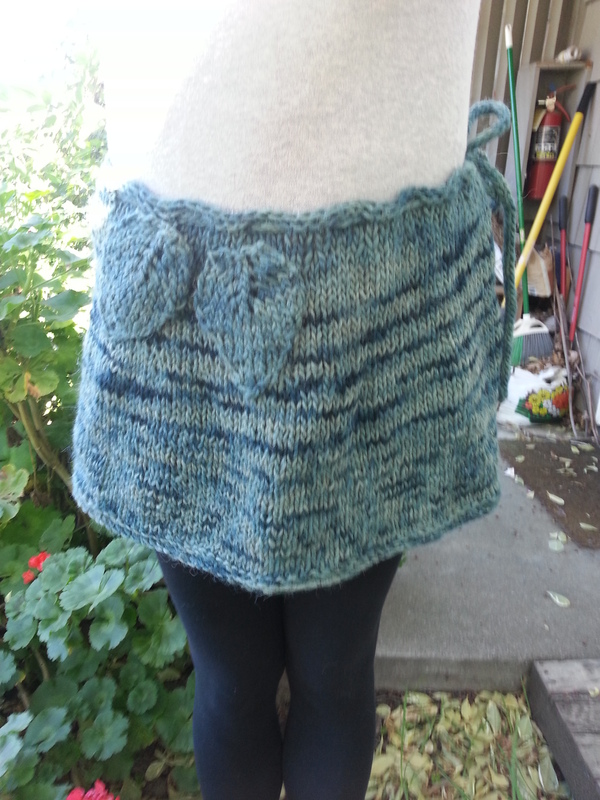 I knit with small amounts of a wool-and-mohair-blend yarn I had in a few colors in my stash. 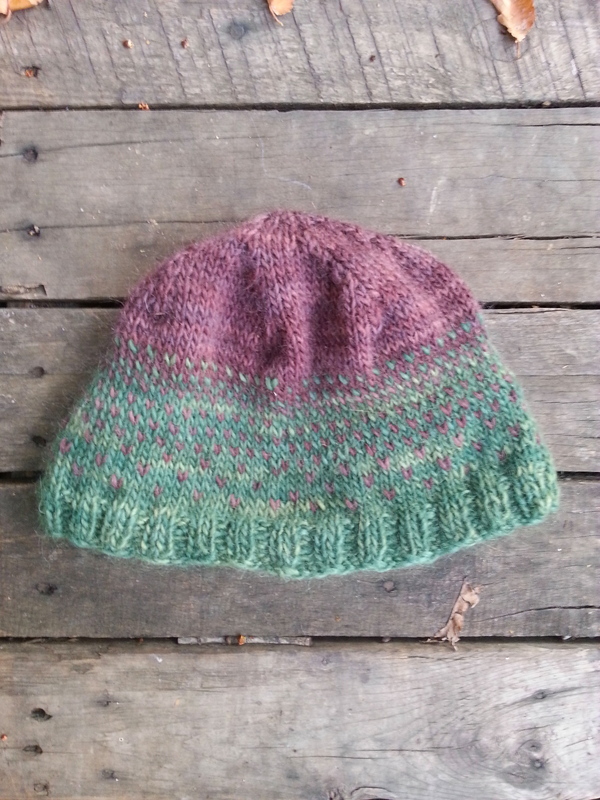 I used the quick and very lovely pattern easy ombre slouch hat by Paul S Neary. Well, sort of. 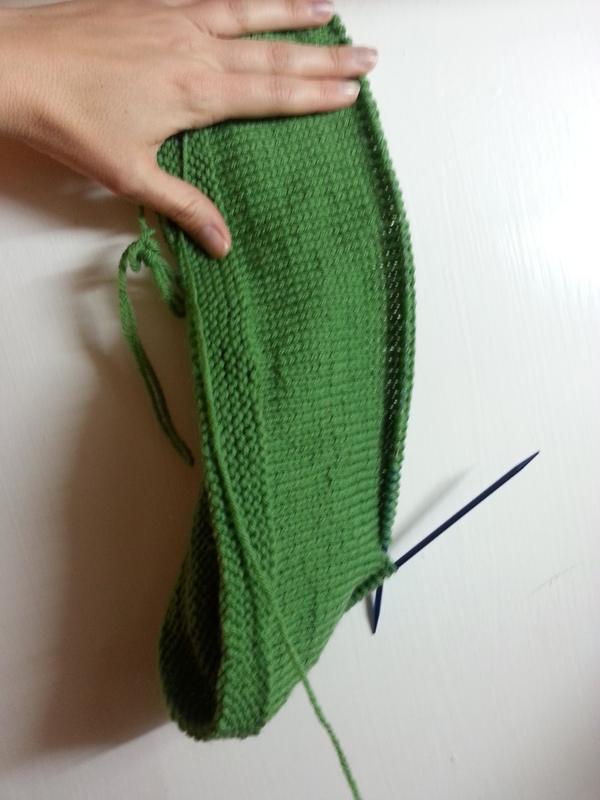 I weighed the yarn on a scale realized I did have enough of the green yarn to do the full pattern. 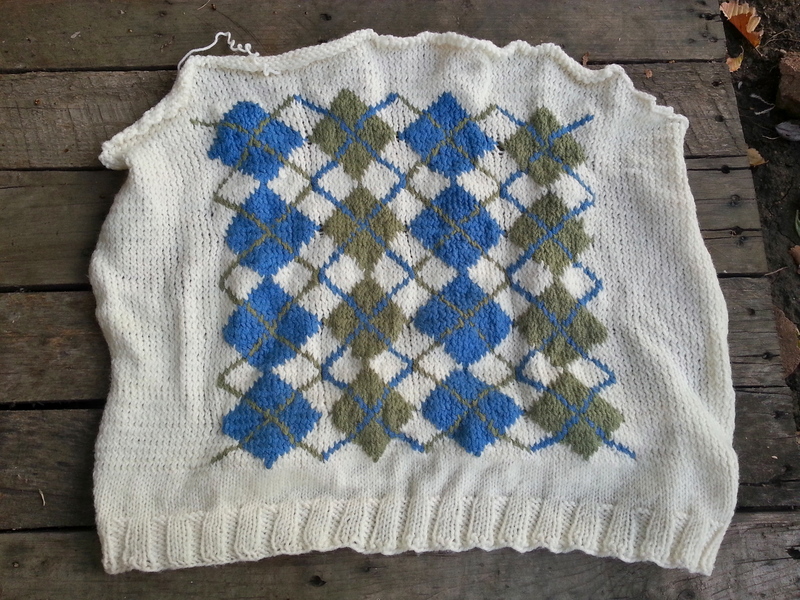 So I just did the colorwork pattern until I ran out of green. And it still looks good. 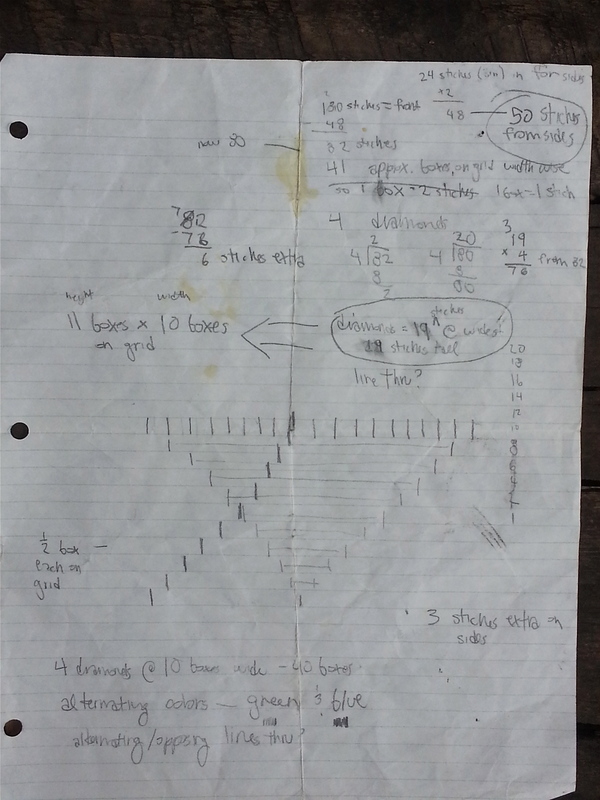 The only disadvantage to this strategy is that I’m going to have to be flexible with the outcomes. 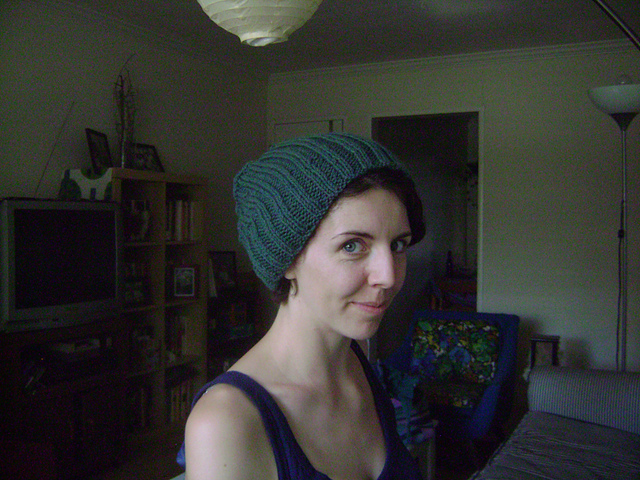 My hat came out far less slouchy because I omitted extra rows of the pattern. I’m going to soak and block it, but it doesn’t seem to quite fit over the sheer volume of my hair now. I think it may need to be a gift to someone else, and I’m ok with that. 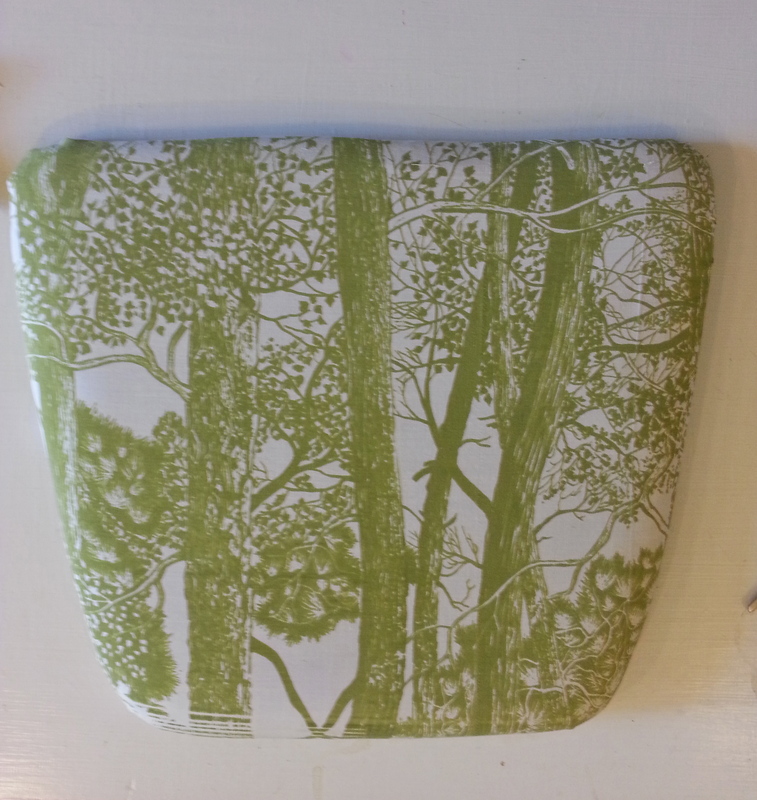 challenge: How to make useful and beautiful things without buying new stuff. I think the hardest thing about trying not to buy new things is that I have to be patient. I have to forgo the instant gratification for the long game of keeping an eye out. It’s probably not a bad trait to work on. 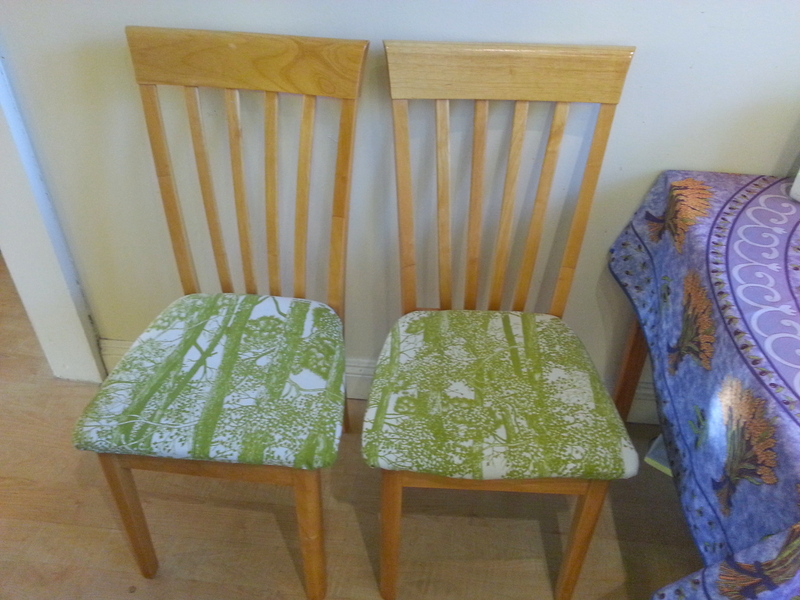 At any rate, being patient was what led me to find and refashion these chairs. 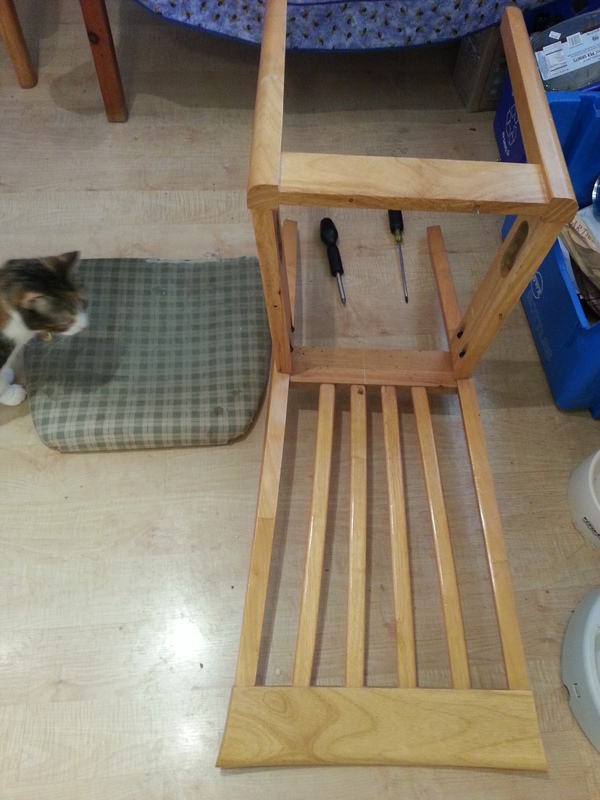 I had been using folding wood chairs in my kitchen for years when I spotted this guy and its twin at my dumpster. I hauled them inside just before a rainstorm. They were not in good shape. 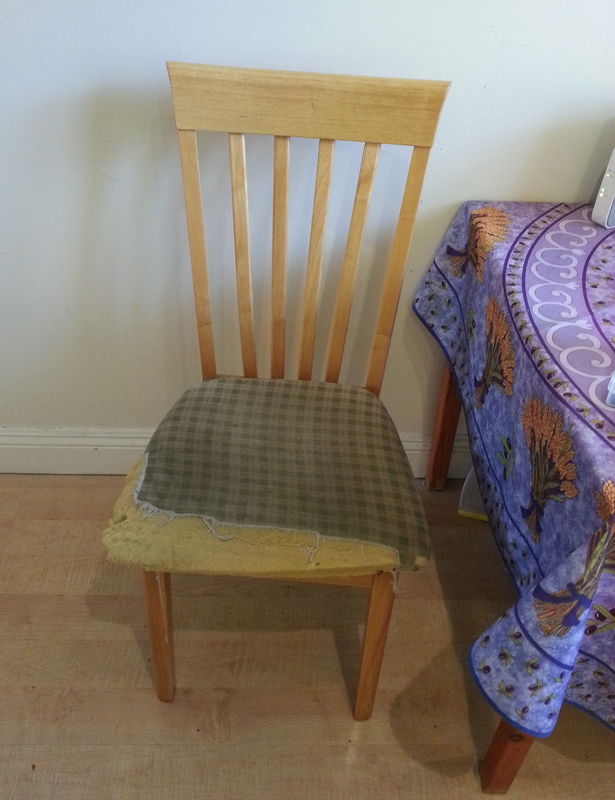 But my neighbor friend had assured me that wooden chairs with fabric covers are easy to re-cover. I found my “fabric” at the thrift store. 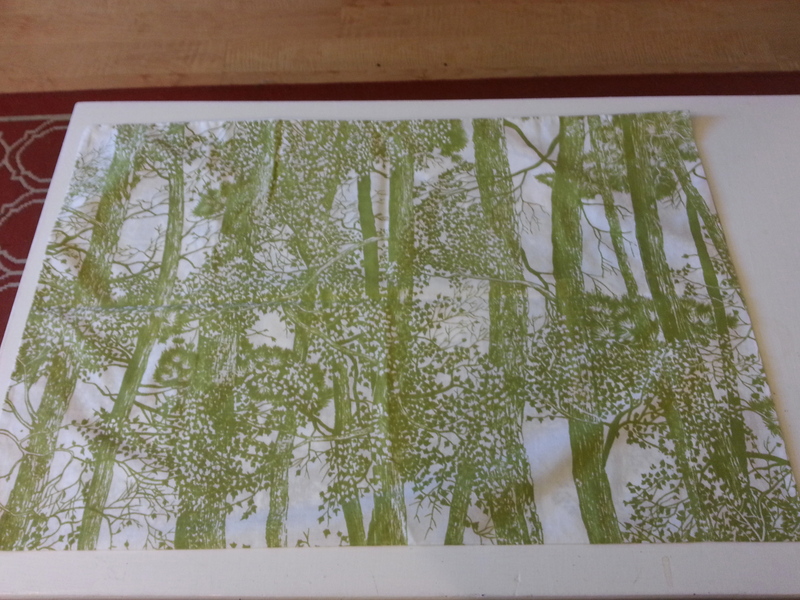 It was a large pillowcase with a green tree print that I bought for 60 cents. 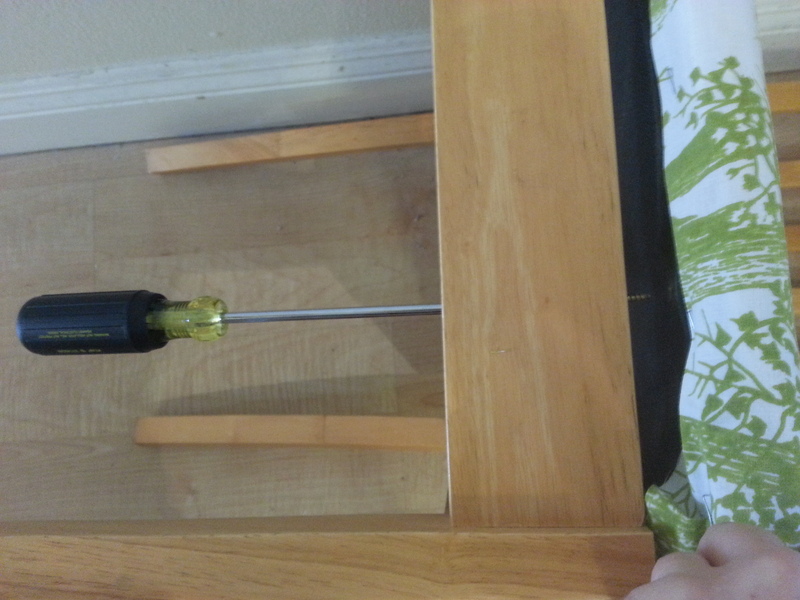 If you want to do this project, make sure you have a screwdriver that fits the screws on the underside of the chair, scissors, a staple gun, and enough staples. 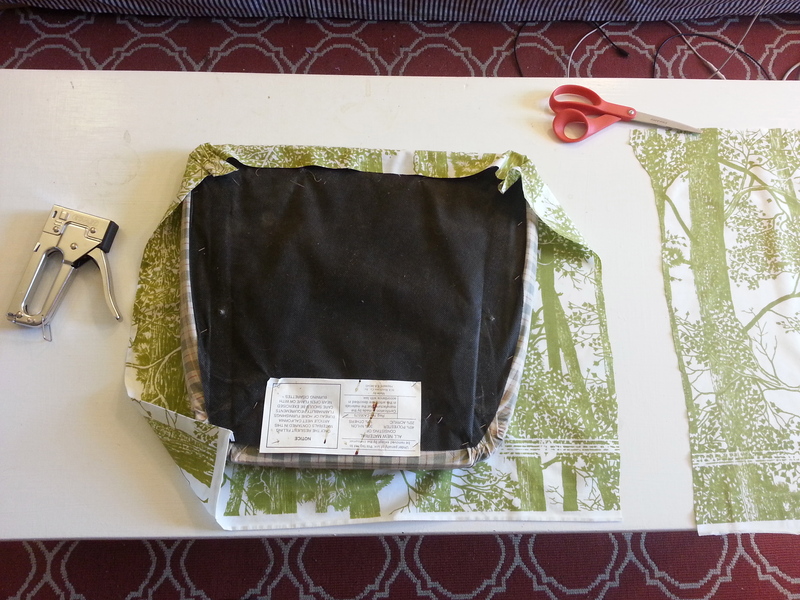 (I borrowed the staple gun and ran to the hardware store to get staples). 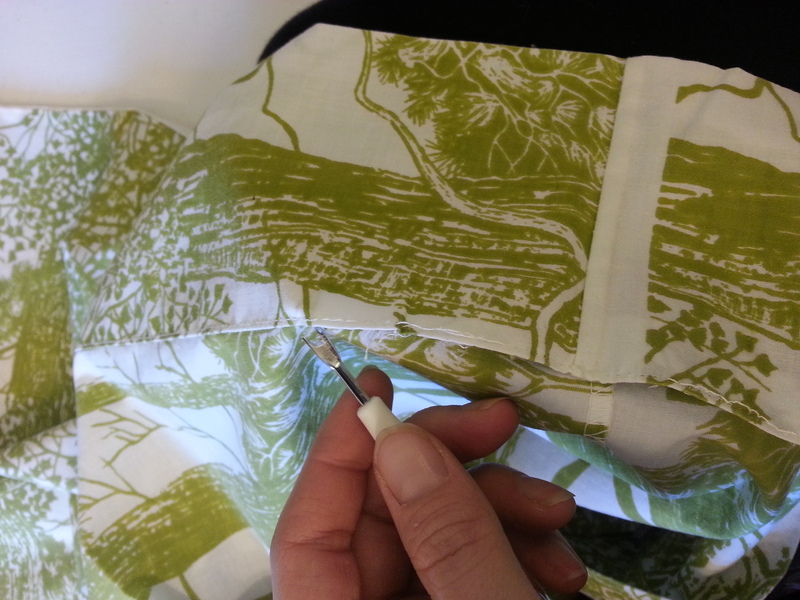 A seam ripper and an iron are also handy if your fabric is being repurposed. And a flashlight or headlamp is a plus if your screws are hard to see. 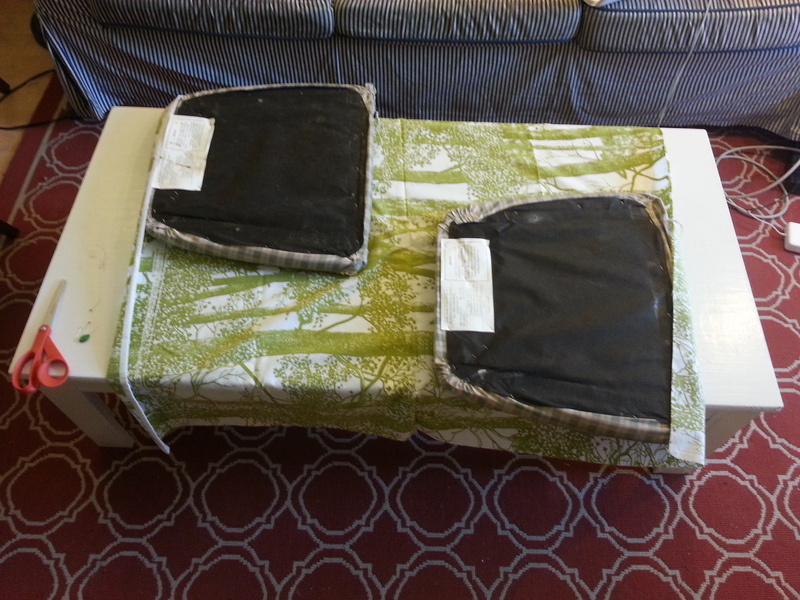 I didn’t “measure” exactly but I did make sure there was enough fabric to cover both seats. Stapling is the most fun part. 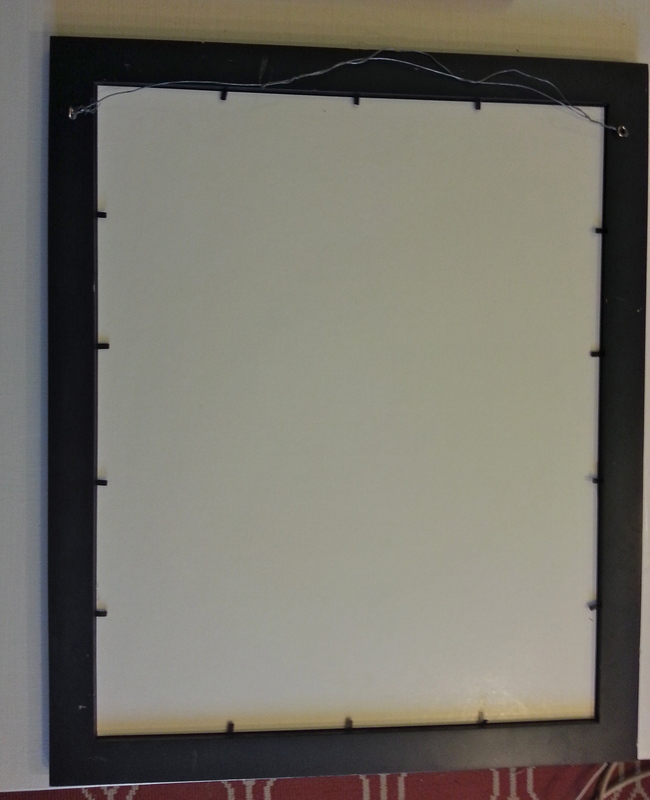 Just make sure that you don’t cover up the holes where the screws are going to go back in. Screwing the whole thing back together is the most annoying part. Again, patience is key. 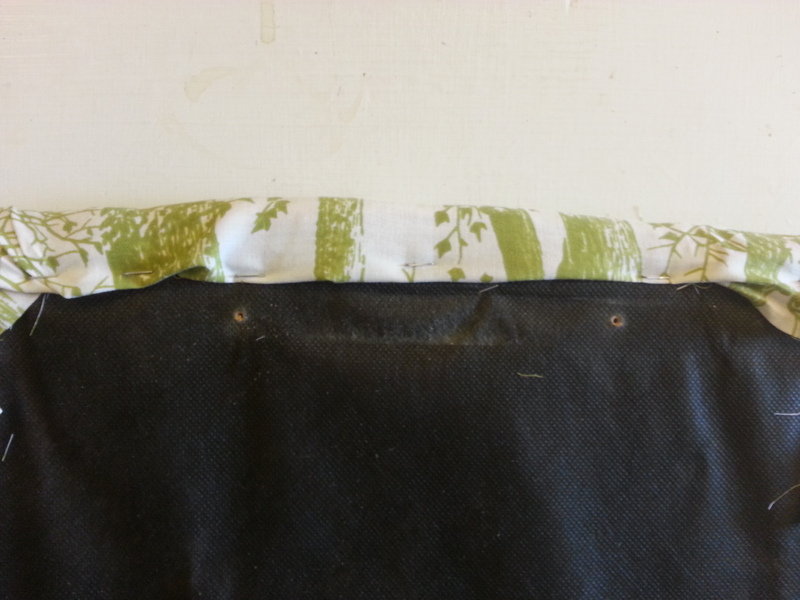 Trim any excess fabric that is in your way. It’s kind of ridiculous that this whole project cost under a dollar, considering how much I like the end result. challenge: How to revisit the incomplete objects from the past and find a place for them in the present. The dirty little secret of any maker of things is the UFO—the unfinished object. 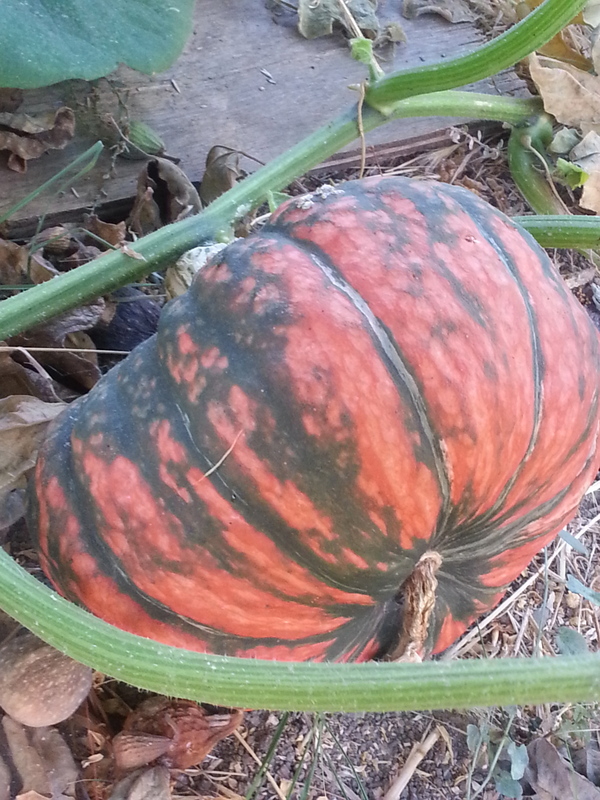 We all have at least one— a project that can’t be completed but also can’t be tossed. They are hidden away for weeks, months—or in my case, ten years. If I am really going to go “out with the new and in with the old,” I have to revisit my UFOs. And I did. To do so, I first I had give up what I had planned for this piece to be back them and think about what it could be here and now. 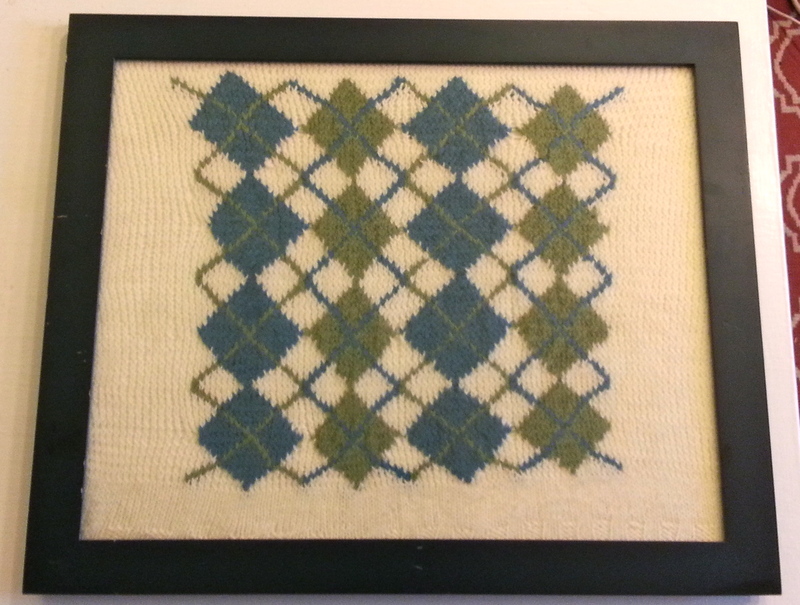 What you see here is the front piece of a completely imaginary argyle sweater. 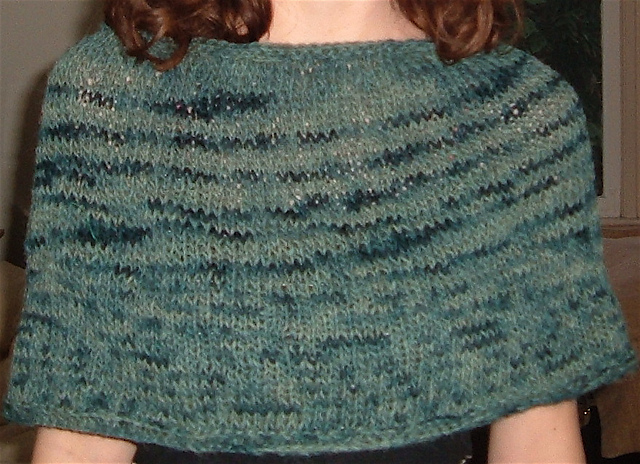 I knit it in 2005—specifically, in February and March during the weeks I was in the hospital after a really bad car accident. I must have asked someone to bring me some knitting needles and yarn from home, but I don’t remember. 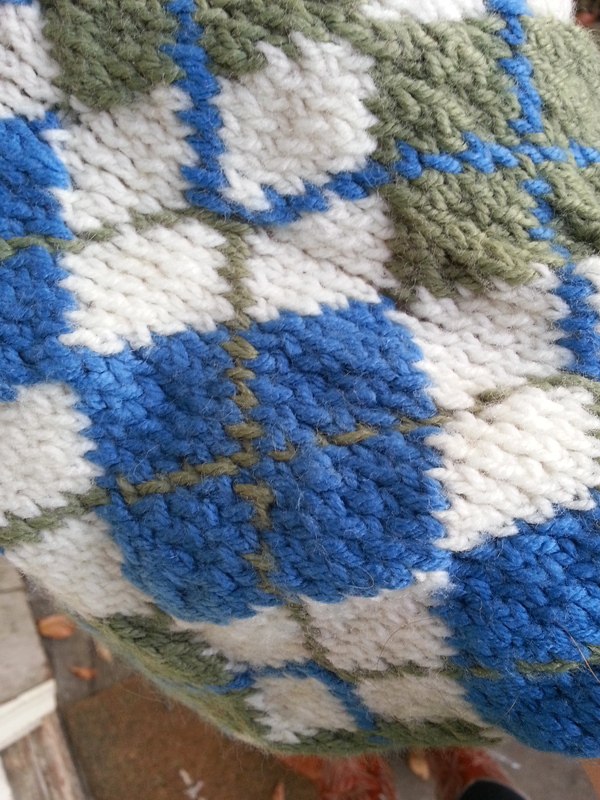 I do remember how I spent ages planning and designing and knitting this blue and green argyle pattern in my hospital bed while I was unable to walk. I was completely determined to knit myself a sweater. 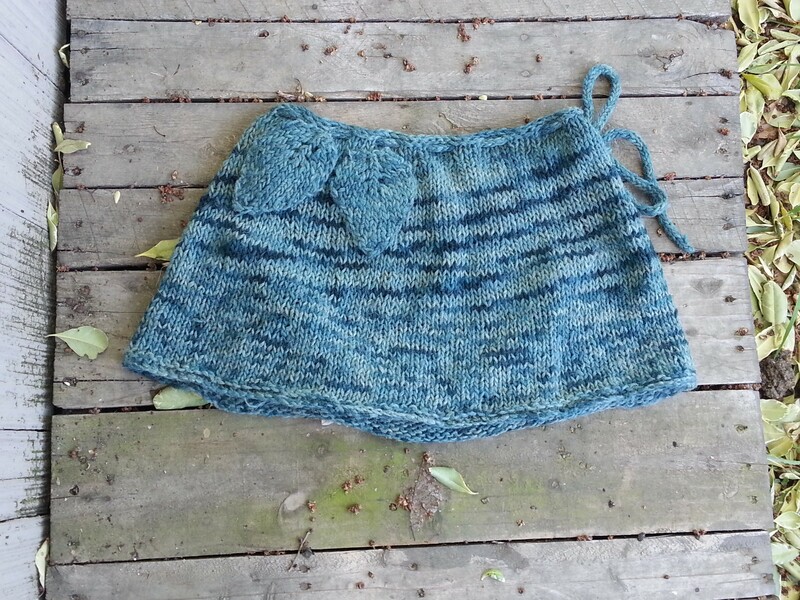 So I knit this whole pseudo pattern, and then it sat, in a bag, doing nothing. 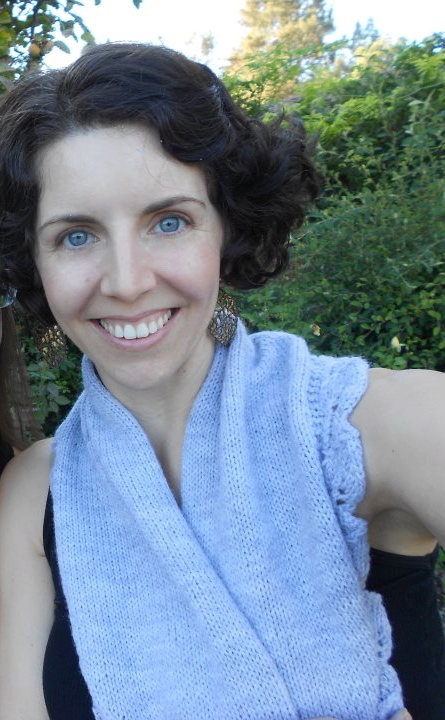 As I got better at knitting, I became convinced it was unredeemable. 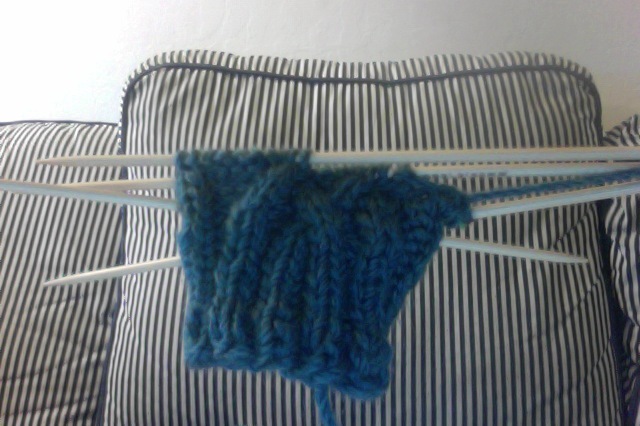 It was a symbol of knitting failure. 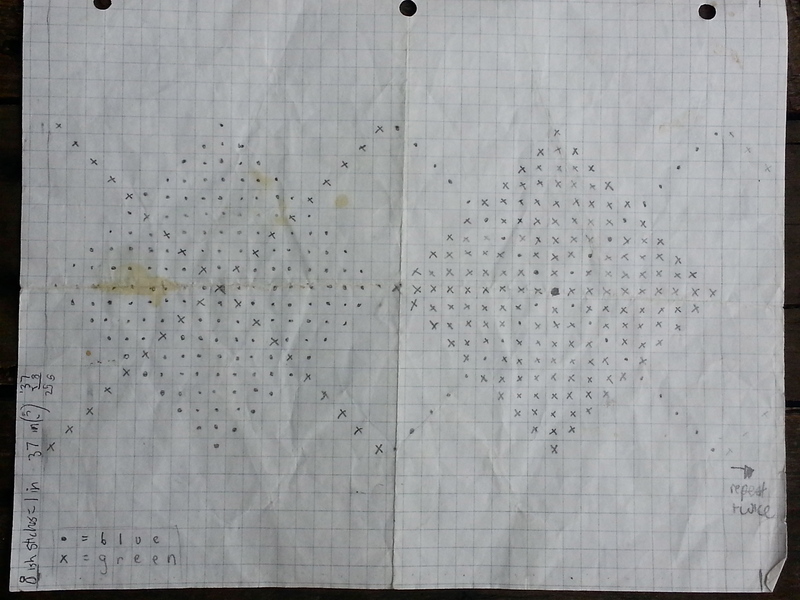 That is, until I rediscovered it while cleaning last weekend. This time it didn’t remind me of failure—I looked at it and remembered how much I had loved it and how it had been a bright spot in my life during a really dark time. 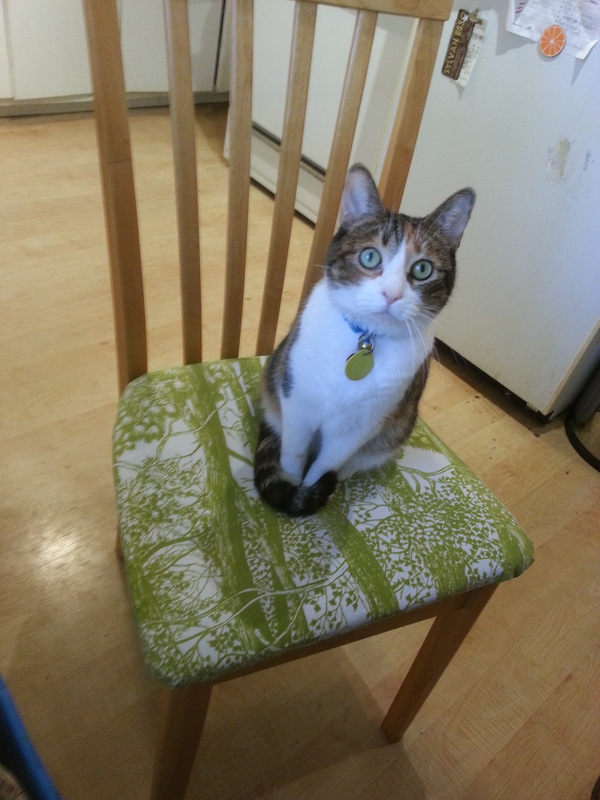 I also still had the borrowed staple gun in my possession, and I had an idea. In keeping with “out with the new,” I went to the thrift store. 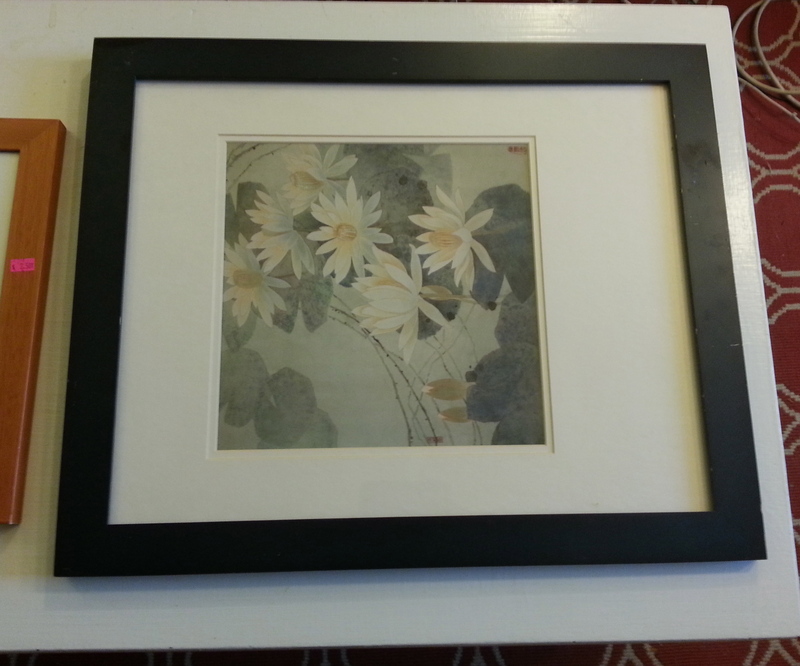 I found a large framed image there for $2.50. 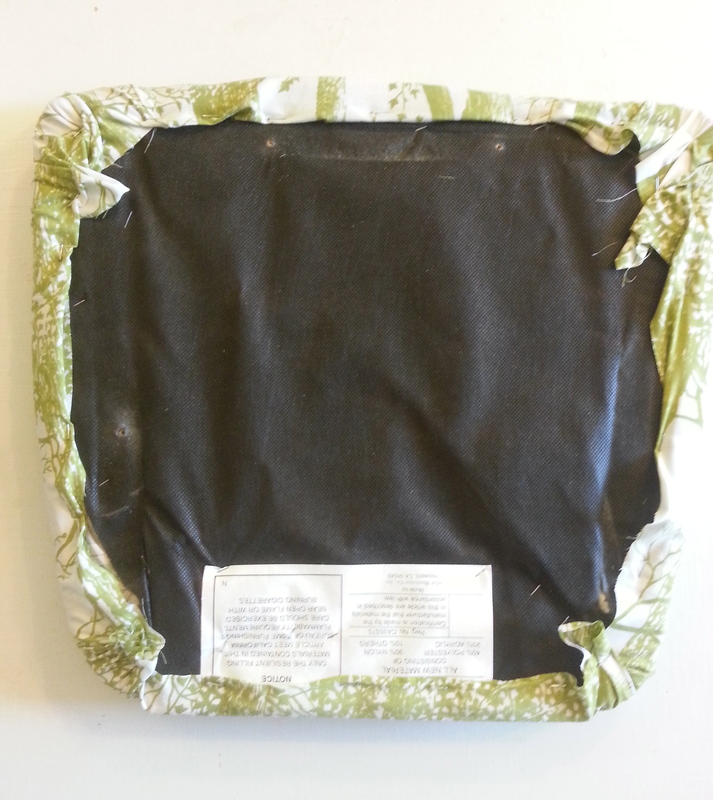 The important thing about the frame was that had a removable back (those little black tabs around the back are always a good sign). I brought it home. I then lightly steam blocked the argyle piece, stretched it across what had been the print inside the frame, and stapled it into place. 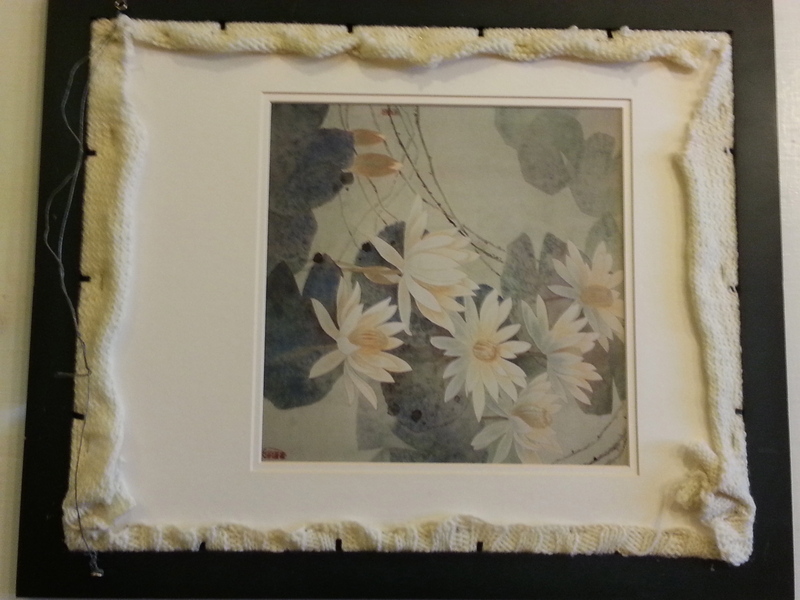 With some careful wiggling, I got it back into the frame and secured with the black tabs. 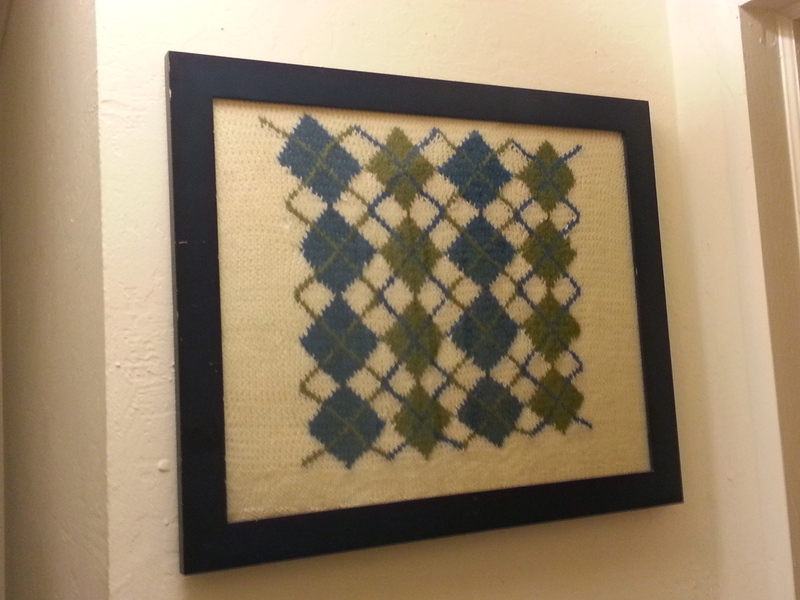 Now my long abandoned argyle sweater project is a framed and mounted work of fiber art on my wall. And I can’t even describe how much joy I feel when I look up at it. 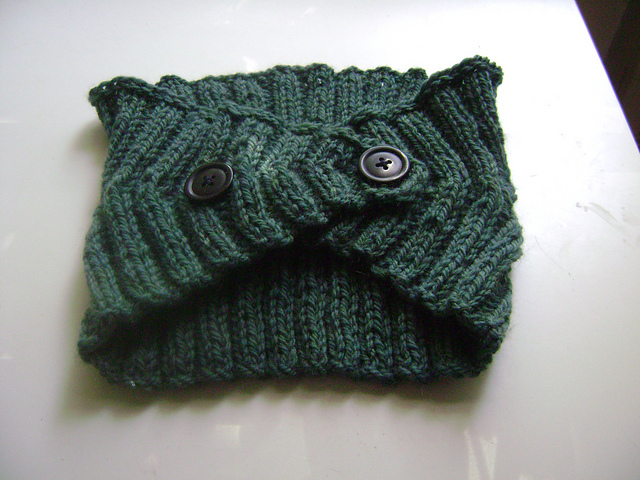 Yes, I was crazy stubborn to try to design and knit my own sweater with no experience from a hospital bed. And yeah, it’s wonky and full of flaws. But I love it— I poured myself into it and I can see the beauty in it now. What was old suddenly looks new. It came to my attention earlier this summer that I only own three washcloths, and one of those was slowly disintegrating. As you can imagine, they were always dirty. The easy solution would be to buy a new pack of washcloths at the store. 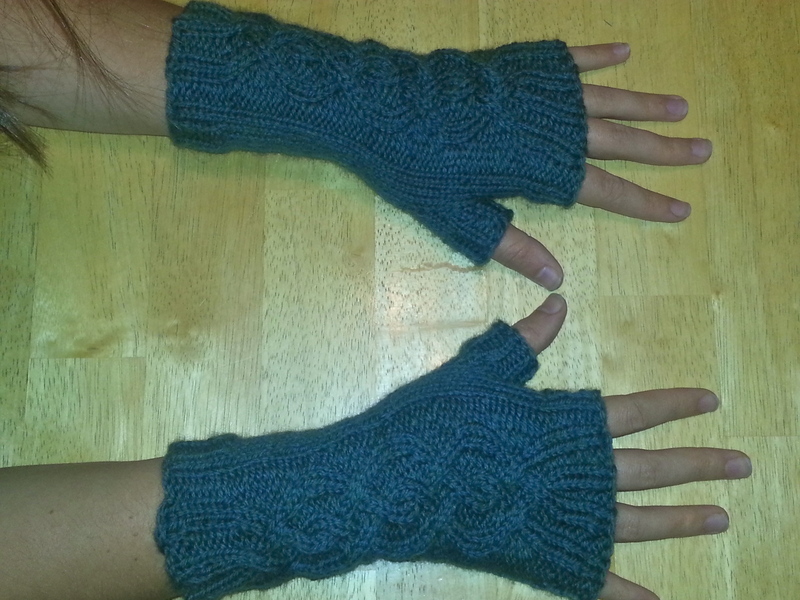 The knitter’s solution, however, was to make some in a cool pattern. 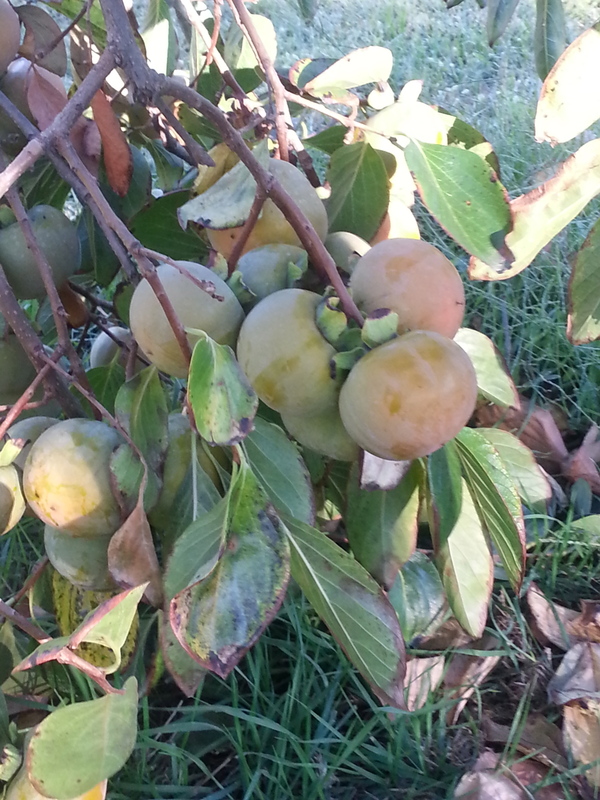 If you’ve read other posts on this blog, you may have noticed I have a penchant for leaves. 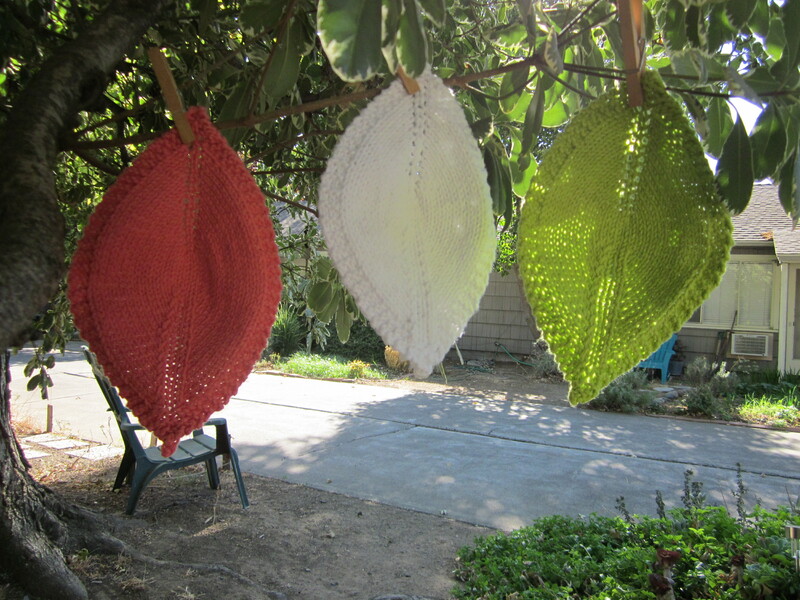 Last year I made a gray leaves shawlette scarf, a pair of peacock colored fern lace socks, and I even painted leaves on the square bowls I made in ceramics class. 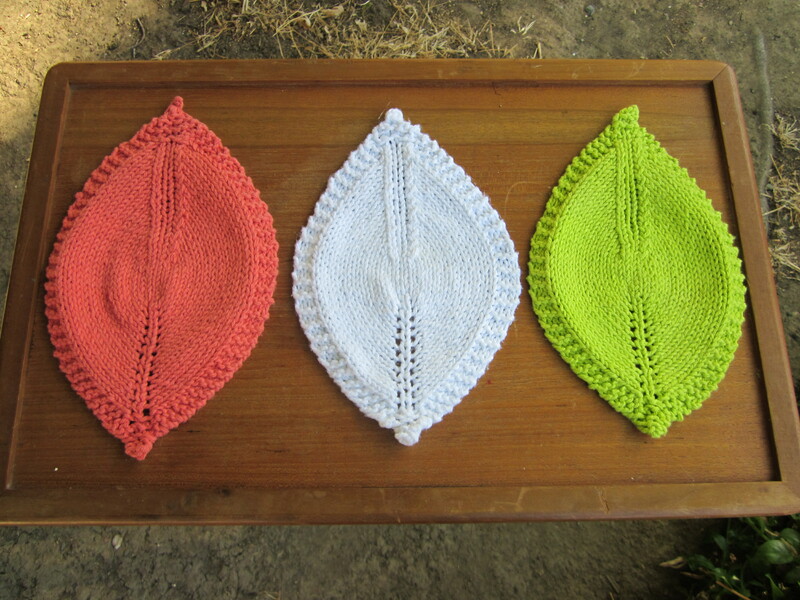 So of course, when I found a leaf shaped pattern for washcloths, it was my first choice. 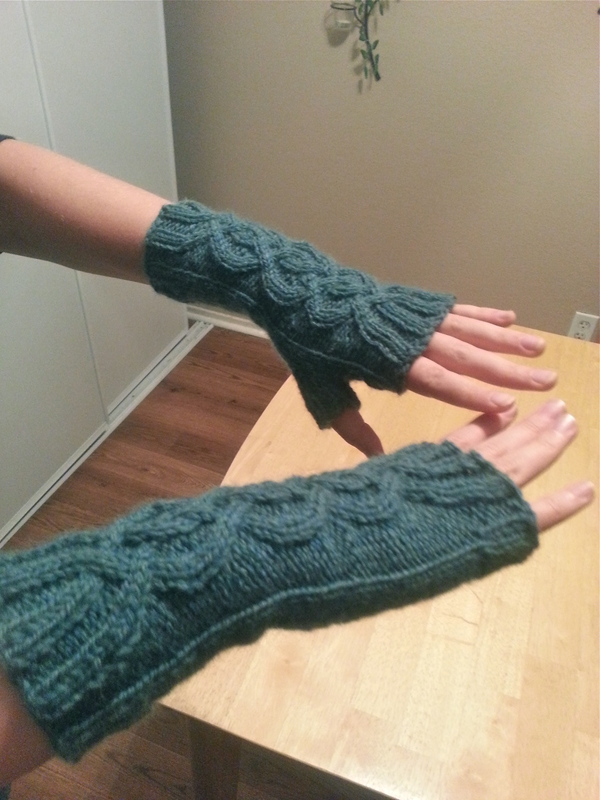 This were a pretty easy knit—it required some attention, but I was able to watch a movie while making them once I got the hang of the pattern. 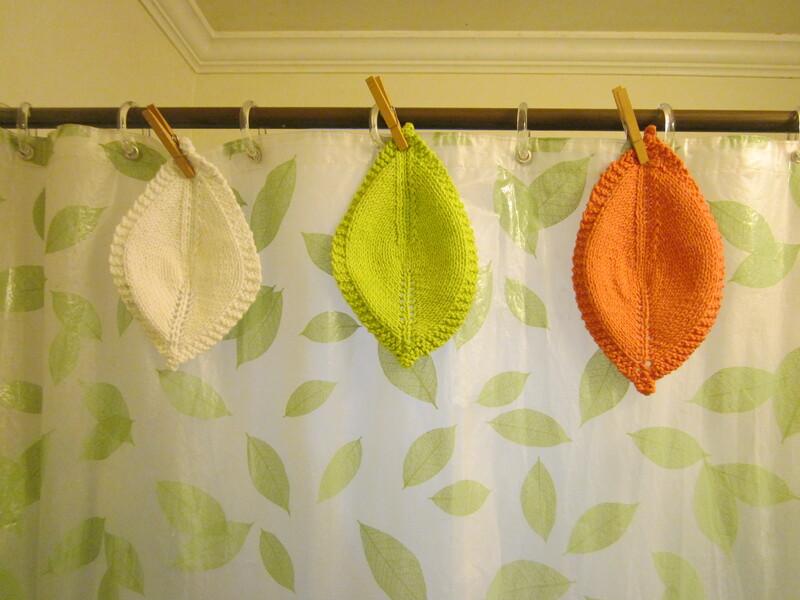 They curl a bit even after blocking—and I’m not sure why the orange leaf turned out larger than the rest! 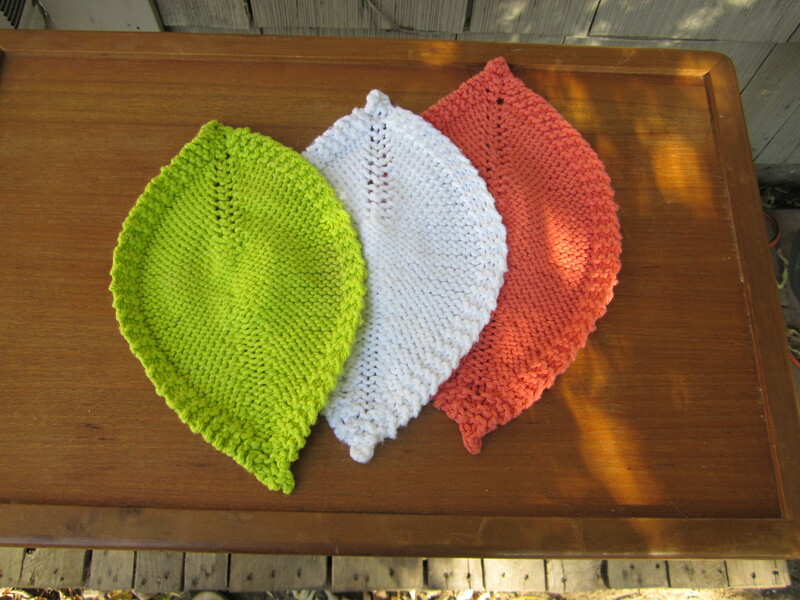 I used the same Bernat Handicrafter Cotton Solids & Denim yarn that I used for the washcloths, dish towels and pot holders that I made for Christmas gifts last year. I ordered a few balls since then because I was running low on some of the colors I liked, but I didn’t end up using them all. 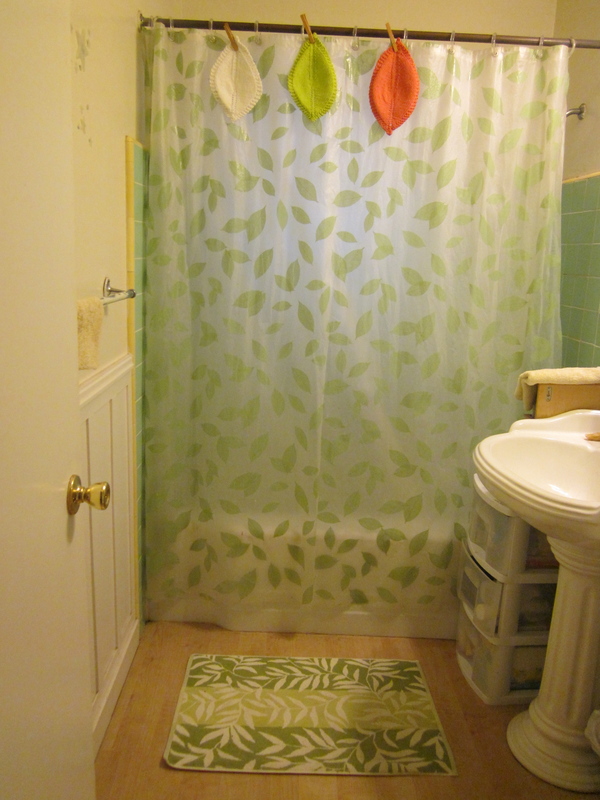 As you’ll notice, the leaf washcloths look right at home in my bathroom, where I already have a leaf print shower curtain and leaves on the bathmat. Yay for serendipitous consistency! The leftover cotton yarn from this and my earlier projects will probably going into the making of this yoga bag pattern, since I think it would be a great use of a bunch of odds and ends to make some colorful stripes. 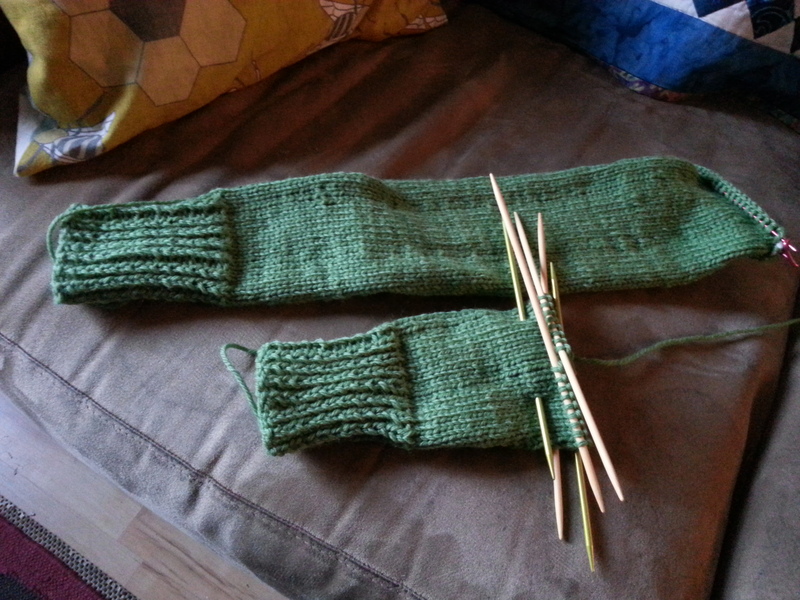 Hopefully that will be yet another quick knit. 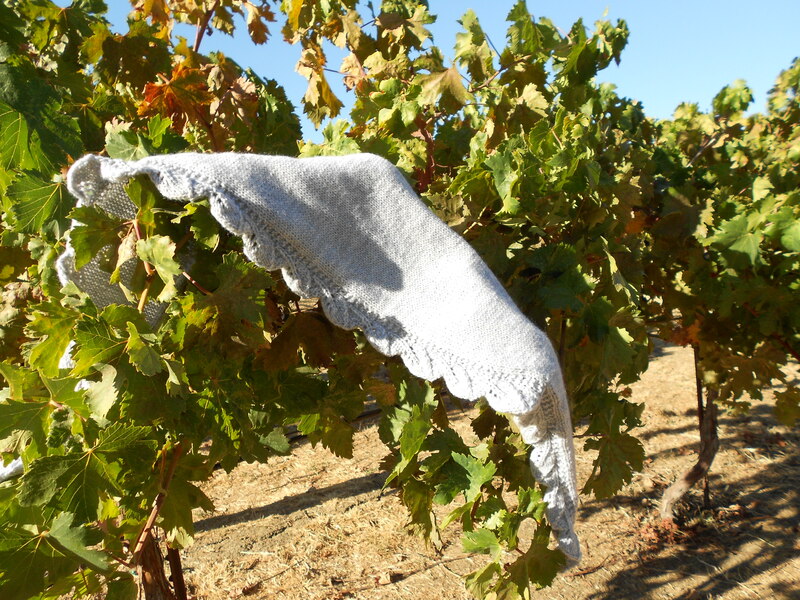 I finished my other leaf-themed knitting project: Saroyan, the scarf-ish shawllette! I’m pleased with how this project came out. 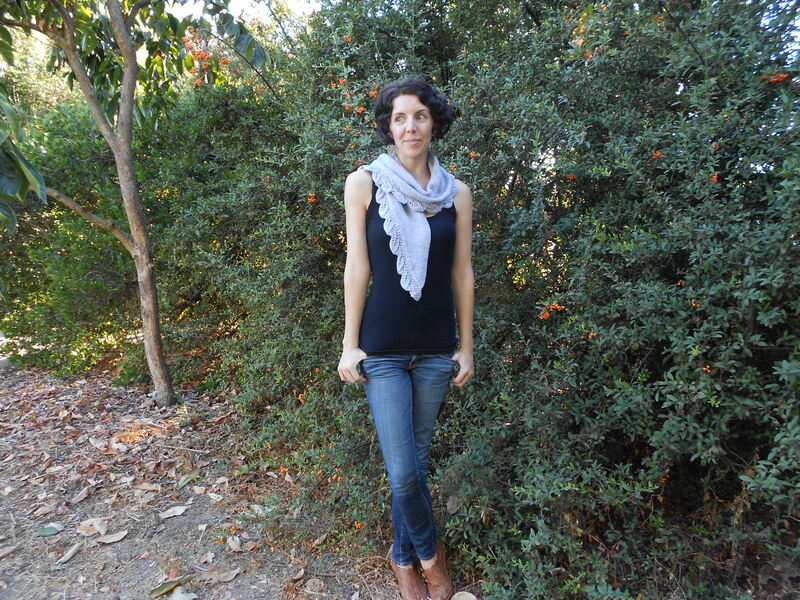 It’s somewhere between a tapered scarf and a shawl, which is great because I didn’t quite know what I wanted. I just wanted leaves. My earlier hunch that light gray would be a good color for this pattern ended up being correct— the leaf edge stands out really well. 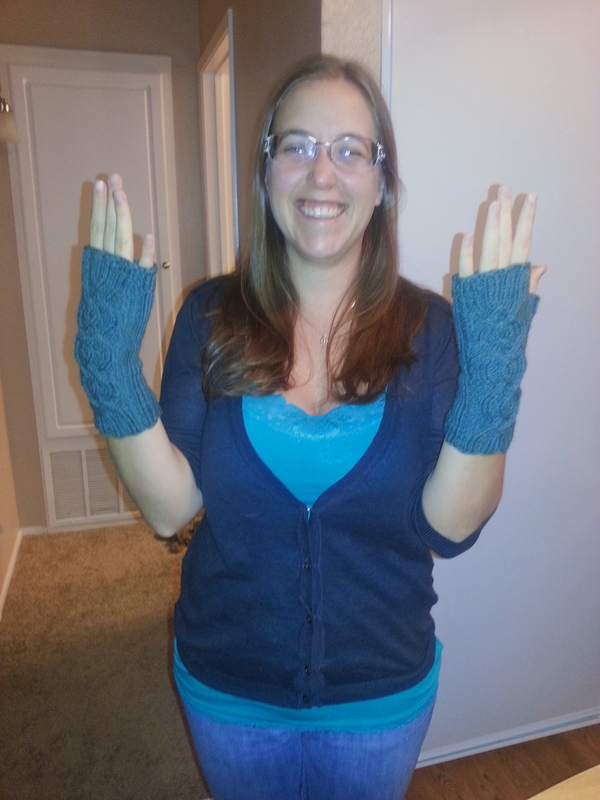 The only modifications I made were adding two extra repeats in the middle section to make it a wee bit longer. I definitely made some small errors in a few places, but they’re not visible unless you are me so I will spare you the details. 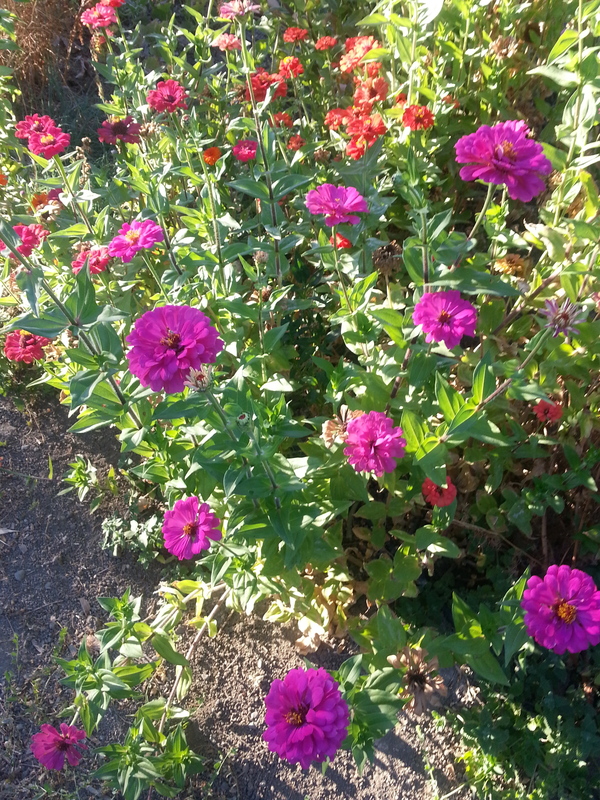 These photos come from last weekend, when my friend and I took a walk around Village Homes, meandering among the scraggly late summer gardens and early fall fruit trees. 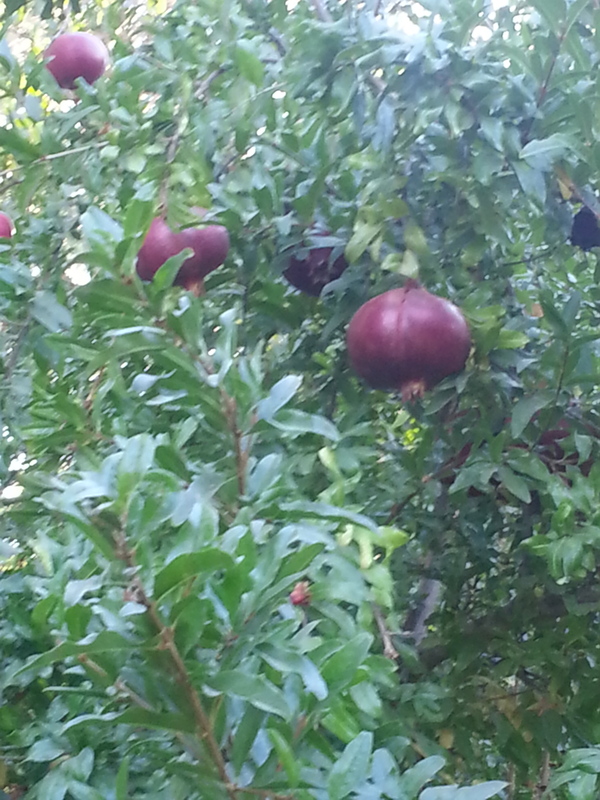 It was a lovely autumn day. 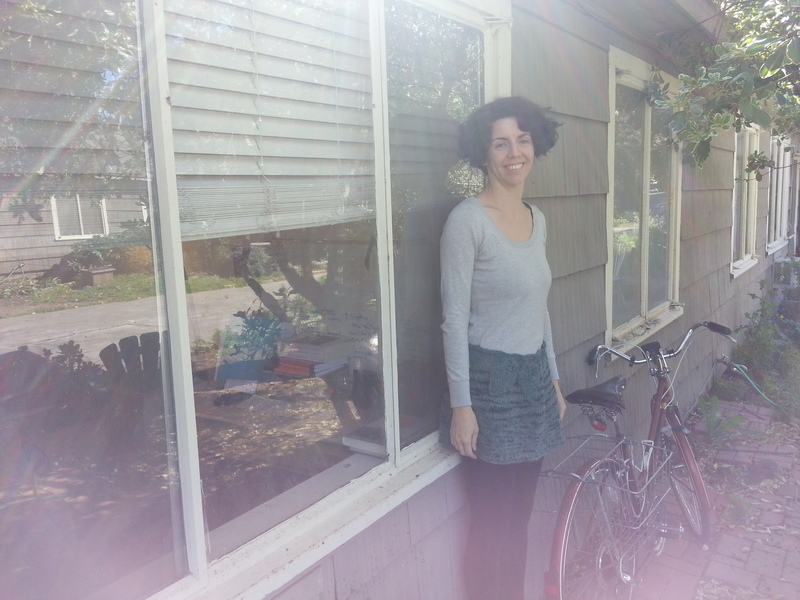 My friend Sarah was nice enough to take a these photos of me wearing Saroyan. Which was awesome. 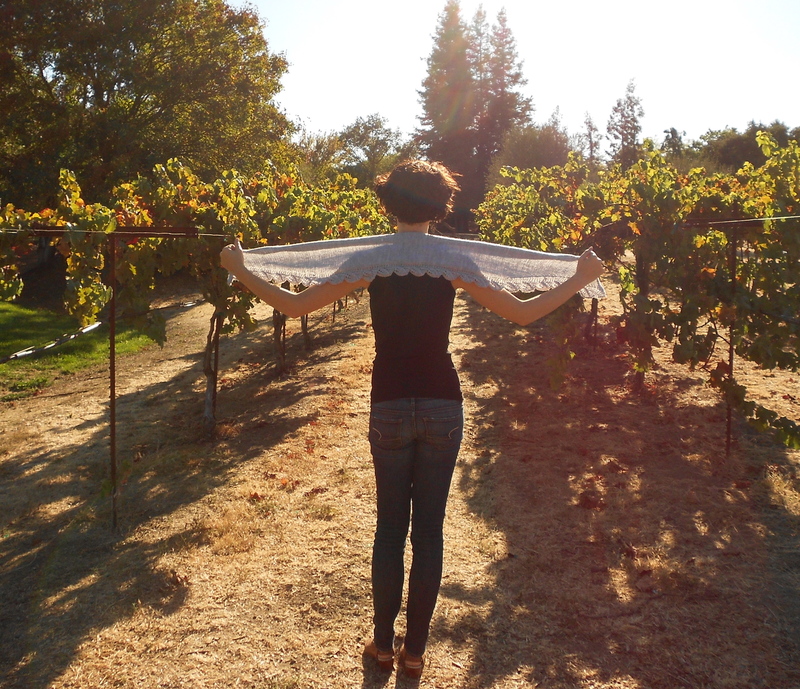 (This must be what an actual photo shoot for a knitting magazine feels like). 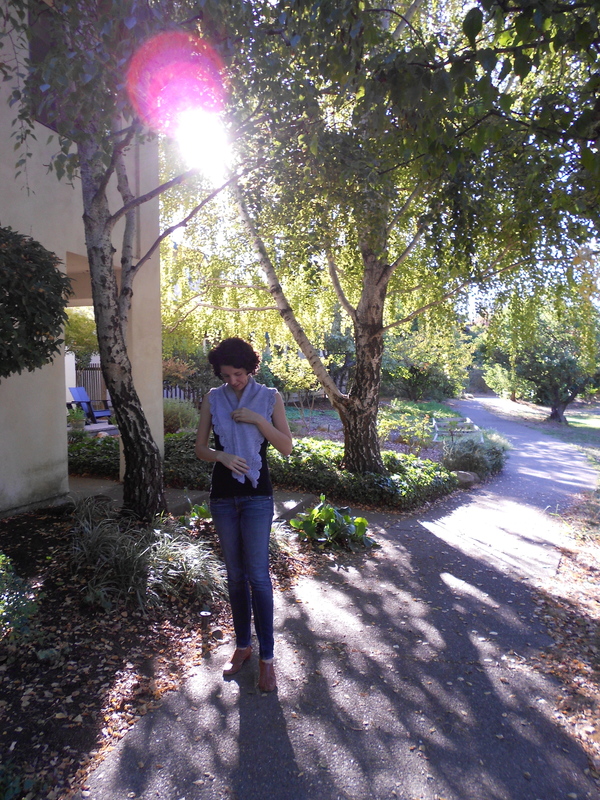 As it turns out, all of her candid shots (when I did not think she was taking a photo) were way better than the ones where I was posing! Well, except for this one I took, which I mainly include so you can see the leaf earrings I was wearing. That is all.